Pneuvay’s latest website comes fully packed with its openinvitation for International Agents to act as distributor of their products and services in theregions of US, UK and Canada. It stretches its arms and welcomes top-ratedcompanies looking for a dependable service provider to supply them with secondto none pneumatic conveying products and services. 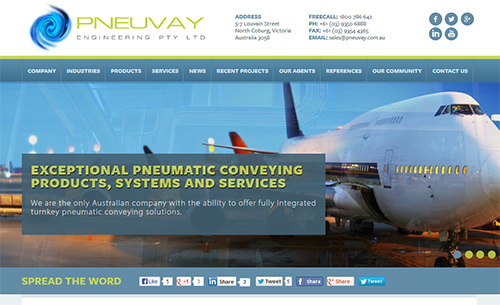 Although the website is just a window of the huge realm of products and services offered by Pneuvay Engineering; with its launch, Pneuvay has reinforced its message that it remains one of the best in the field of pneumatic conveying in Australia and around the globe.